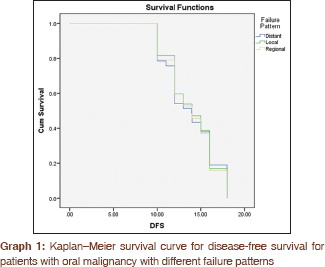 Background: The aim of this study was to retrospectively evaluate various patterns of failure in patients with oral squamous cell carcinoma and to estimate overall survival (OS) and disease-free survival (DFS) in failure patterns. Materials and Methods: Retrospective data of 500 patients operated for oral malignancy were obtained from year 2011 to 2014. Incidence of local, regional, and distant failure as well as DFS and OS was calculated. Furthermore, we studied various prognostic factors such as habits and coexistent comorbid conditions, depth of invasion, histological grade of tumor, and primary site of tumor. 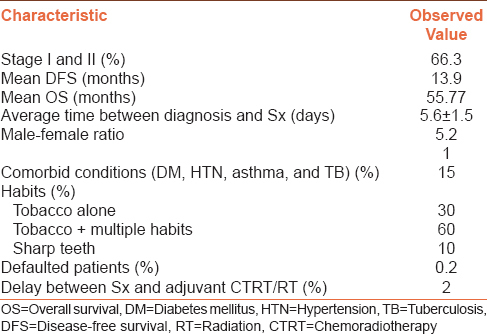 Results: Average DFS was 13.9 months and average overall survival was 55.77 months. The overall incidence of recurrence was 42.4%. Incidence of local recurrence was 24%, regional recurrence was 11.2%, and distant failure was seen in 7.2% of cases. Conclusion: Despite execution of standard treatment protocol comprising of surgery and chemoradiation, incidence of recurrence remains sententious in oral malignancy. Oral squamous cell carcinoma is a second-most common malignancy in the Indian subcontinent. Despite the revolution in chemotherapy, radiotherapy, and use of multimodality of treatment plan, failure rate remains significant. As disease has aggressive biological behavior and patients usually present at advanced stage of the disease along with this, the concept of field cancerization increases likelihood of recurrence and development of the second primary in oral malignancy. Basically, the site of primary tumor, surgeon's choice of treatment, and tumor stage influences the outcome of oral malignancy. The aim of this study was to retrospectively evaluate various patterns of failure in patients with oral squamous cell carcinoma and objective was to find a correlation between various prognostic factors in failure patterns. Retrospective data of 500 patients operated at our institute for oral cancer were obtained from hospital management software system from year 2011 to 2014. Inclusion criteria for this study were male and female patients ranging from age 28 to 70 years, primary tumor site with buccal mucosa, tongue, lip, and alveolus, Stage I to IV resectable disease and medically compromised patients with diabetes, hypertension, Koch's, asthma, and chronic obstructive pulmonary disease (COPD). Exclusion criteria include patients with unresectable tumors requiring palliative care, patients with primary tumors of larynx and thyroid. The incidence of local, regional, and distant failure as well as disease-free survival (DFS) and overall survival was calculated. Furthermore, we studied various prognostic factors such as habits, existent comorbid conditions, depth of invasion, histological grade of tumor, primary site of tumor, average time interval between diagnosis and surgery; patients defaulted for treatment due to any reason, delay in adjuvant radiation, or adjuvant chemoradiation after surgery. The data were tabulated in Microsoft Excel software 2013 and subjected for statistical analysis using IBM SPSS 23 (IBM Inc, Chicago, USA). Descriptives for mean age, frequencies, and percentages for categorical data were done. One sample t-test was done to evaluate the significance of the data. Chi-square test was applied for the overall comparison of various failure patterns. DFS and OS were demonstrated using Kaplan–Meier curve. Mean follow-up time was 62 months. About 66.3% patients belonged to Stage I and Stage II disease category at the time of diagnosis. A total of 212 (42.4%) had metastasis after treatment. Male-to-female ratio was 5.2:1. Average time interval from the confirmation of diagnosis to surgery in indicated patient was 5.6 ± 1.5 days. Patients with multiple habits were 60%, with only tobacco habits were 30%, and those with complaints of sharp teeth, ill-fitting dentures, and chronic irritation with no associated habit were 10%. Patients with tongue primary were 35%, buccal mucosa 45%, alveolus 5%, and lower lip 5%. About 2% of patients delayed the adjuvant therapy after surgery. Nearly 0.2% patients defaulted in between radiation due to intolerance to side effects [Table 1]. Patients with Grade I squamous cell carcinoma (SCC) were 28%, Grade II SCC were 56%, and those with Grade III SCC were 16%. Average depth of invasion was 0.6 cm. Average DFS rate was 13.9 months. [Table 2] and [Table 3] show mean and median values for DFS and OS, respectively, in patients with local, regional, and distant failures. [Table 4] and [Table 5] show test of equality for overall comparison using Chi-square test for DFS and OS, respectively. [Graph 1] and [Graph 2] show Kaplan–Meier survival curve for DFS and OS, respectively, for patients with oral malignancy with different failure patterns. Average overall survival was 55.77 months. Overall incidence of recurrence was 42.4%. The incidence of local recurrence was 24%, regional recurrence was found to be in 11.2%, and distant failure was seen in 7.2% of cases [Table 6]. Among local recurrence primary site with buccal mucosa was 47.5% (n = 57/120), with tongue was 23.33% (n = 40), with alveolus was 9.16% (n = 11), and with lower lip was 12% (n = 12). One sample t-test was applied to the observed distribution of local, regional, and distant failure its P = 0.042 which is statistically significant. Among all distant metastasis incidence of lung metastasis was 38.88%, skin metastasis was 33.33%, liver metastasis was found in 5.55%, and skeletal metastasis was found in 22.22%. Treatment failure is contributed by various factors and its exact cause cannot be stated clearly. Patients with advanced oral squamous cell carcinoma have dismal long-term survival because of the locoregional as well as distant failure pattern. Local recurrence in oral SCC (OSCC) ranges from <10% to about 50% depending on the primary site and stage of the disease., In our study, the local recurrence was found to be 24% which is comparable to other studies. It is observed that majority of patients with local failure had buccal mucosa as the primary site of tumor. Patients with advance OSCC fails either locoregionally or at a distant site, while patient with early-stage disease recurs locally mainly due to the presence of the second primary. In our study, 66.3% patients belonged to Stage I and Stage II disease [Table 1], still the recurrence rate observed was high which can be attributed to occurrence of second primary in early-stage disease. Although advancement in treatment modality for OSCC has been greatly increased, survival has not been improved in these patients., In our study, we have observed the DFS of about 13.9 months [Table 1] which is quite less even after upgradation in treatment strategies. Regional failure is defined as recurrence in the neck. It is commonly seen in cases where neck dissection remains inadequate or skip metastasis at the time dissection. In our study, regional failure was found to be 11.2% which is cognated to the previous studies. Deschamps et al. espied in his study that those patients who were treated by salvage neck dissection for neck recurrence showed best survival irrespective of whether the neck has been addressed before or not. At our institute, all patients with nodal recurrence were treated with salvage neck dissection and based on histopathology report further treatment was advised in terms of metronomic therapy or chemotherapy, as indicated. Patients with regional recurrence are associated with poor prognosis.,, We advocated use of palliative chemotherapy for patients with nodal recurrence on ipsilateral side despite of definitive neck dissection. In this study, it was observed that nodal recurrence was more common in tongue primary cases on the contralateral neck within few months of definitive surgery; salvage neck dissection was done in these patients. Various poor prognostic indicators contributing to the recurrence are depth of invasion, nodal involvement, histopathologic grade of the tumor, extracapsular spread (ECS), and lymphovascular invasion (LVI). Patients with ECS, LVI, and depth of invasion >0.5 cm should be considered as high-risk patient for recurrences either local or regional failure. We have observed that 18.8% patients with recurrence were positive for ECS/LVI. Grade III tumors have been considered as a poor prognostic indicator; in our study, we have found that patients with Grade II disease have showed regional failure. We observed that patients with tongue as primary tumor with histological Grade II showed significant regional recurrence of 8.2%. About 15% of patients had compromised systemic condition such as asthma, COPD, diabetes, and hypertension. Compromised systemic conditions have led to delayed surgical recovery in the postoperative period. It is advisable to start adjuvant treatment within 21 days after surgery. About 2% of patients defaulted for adjuvant treatment for about 1-month period which significantly contributed to the locoregional recurrence in them. Comorbid conditions can contribute a little to the recurrence in head-and-neck cancer patients as it raises the wound-related complications and delays further treatment. Furthermore, 0.2% of patients defaulted during adjuvant radiotherapy due to intolerance to radiotherapy-related side effects which finally result in treatment failure. Distant failure is commonly seen in patients receiving neoadjuvant chemotherapy (NACT) for advanced head-and-neck SCC compared to locoregional recurrence which was usually seen before the multimodality of treatment. In contrast to this, we have observed that 50% of patients who had received NACT presented with locoregional failure during routine follow-up. In our experience, the direct distant failure without the locoregional involvement was seen in almost all patients with Stage I, Stage II, Stage III, or Stage IV disease. Rate of distant failure was 7.2% in our study. Among all distant metastasis, the incidence of lung metastasis was 38.88%, skin metastasis was 33.33%, liver metastasis was found in 5.55%, and skeletal metastasis was found in 22.22%. Interestingly, distant metastasis with the involvement of only 1 organ is seen in more than 70% of cases and multiorgan involvement was seen with either lung and bone combination or lung and skin combination. Local failure is more common than nodal and distant failure which can be partly attributed to the concept of field cancerization but still requires further detailed studies to validate. Along with clinical and histopathological parameters, existent systemic comorbidities prevail on the prognosis of oral malignancies still the failure pattern remains capricious. Lester SE, Wight RG. 'When will I see you again?' Using local recurrence data to develop a regimen for routine surveillance in post-treatment head and neck cancer patients. Clin Otolaryngol 2009;34:546-51. Cooney TR, Poulsen MG. Is routine follow-up useful after combined-modality therapy for advanced head and neck cancer? Arch Otolaryngol Head Neck Surg 1999;125:379-82. Wanebo HJ, Chougule P, Ready N, Koness RJ, Akerley W, McRae R, et al. Preoperative chemotherapy with paclitaxel and carboplatin and radiation achieves high rates of local regional control but continued erosion of survival by distant disease. Proc A Soc Clin Oncol 2001;20:235. Buckley JG, Ferlito A, Shaha AR, Rinaldo A. The treatment of distant metastases in head and neck cancer – Present and future. ORL J Otorhinolaryngol Relat Spec 2001;63:259-64. Taneja C, Allen H, Koness RJ, Radie-Keane K, Wanebo HJ. Changing patterns of failure of head and neck cancer. Arch Otolaryngol Head Neck Surg 2002;128:324-7. Zitsch RP 3rd, Park CW, Renner GJ, Rea JL. Outcome analysis for lip carcinoma. Otolaryngol Head Neck Surg 1995;113:589-96. Deschamps DR, Spencer HJ, Kokoska MS, Spring PM, Vural EA, Stack BC Jr. Implications of head and neck cancer treatment failure in the neck. Otolaryngol Head Neck Surg 2010;142:722-7. Sano D, Myers JN. Metastasis of squamous cell carcinoma of the oral tongue. Cancer Metastasis Rev 2007;26:645-62. Clark J, Li W, Smith G, Shannon K, Clifford A, McNeil E, et al. Outcome of treatment for advanced cervical metastatic squamous cell carcinoma. Head Neck 2005;27:87-94. Chu PY, Li WY, Chang SY. Clinical and pathologic predictors of survival in patients with squamous cell carcinoma of the hypopharynx after surgical treatment. Ann Otol Rhinol Laryngol 2008;117:201-6.